Experience Cairns at full throttle, with sea spray in your face and the sweet sound of a 700 horsepower engine in your ears! Experience Cairns at full throttle, with sea spray in your face and the sweet sound of a turbocharged engine in your ears! Jet boating includes massive sideways slides, awesome fish tails, wave riding as well as unique views of Trinity Inlet, mangroves, wildlife and (if you are lucky) maybe even a croc! Your jet boat adventure begins at Marlin Marina with a comprehensive safety briefing and a rundown of the trip ahead. In the boat, with the jet boat's power finally unleashed, you'll soar past the superyachts and charter boats berthed at Trinity Inlet and experience a roller coaster of manoeuvres orchestrated by the jet boat pilot. Your jet boat ride is 35 minutes of non-stop excitement and thrills. 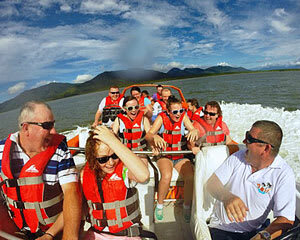 Each jet boat ride can take up to 15 passengers. Rides operate from Tuesday to Sunday (daily during QLD school holidays). Cairns never looked so thrilling! The guys at Bad Fishy Jet Boating were fantastic! It was a great experience for our whole family. As well as a thrilling ride our driver stopped to point out some interesting sights along the waterway. It was the best ride my mum has ever had. She has Now Ticked off her bucket list. Thank you BAD FISHY. Will definitely be using your service again. Thank you so much. While on holidays for a week in Cairns we had an awesome experience onboard Bad Fishy ?????? Joe (captain)was absolutely fantastic and also made a great guide along the way,which great! The whole experience including speaking to great friendly and helpful staff (Nikki) on phone .. We will definitely be back to do it again !!!! Thank you for your great service, we will definitely recommend this experience !! (Phil & Dawn) Adelaide SA???????? The jet boat was much more fun than I ever expected and the driver really made the trip as he was so friendly and relaxed. It was a gift for my husband but we both had a great time. Highly recommended! Thanks to Joe the Driver and Bek (Bad Fishy) for making this so wonderful.